Terms Specific to Market Data provided by Options Price Reporting Authority (“OPRA”). Neither OPRA, the Processor nor any Participant guarantees the timeliness, sequence, accuracy or completeness of any OPRA Market Data, and neither OPRA, the Processor, nor any Participant shall be liable in any way to any Client or to any person whatsoever for any loss, damages, cost or expense which may arise out of any failure of performance by OPRA, the Processor or the Participant, or from any delays, inaccuracies, errors in, or omissions of, any OPRA Market Data, or in the transmission or delivery thereof, whether or not due to any negligent act or omission on the part of OPRA, the Processor or any Participant. In no event shall OPRA, the Processor or any Participant be liable for any incidental, special, indirect or consequential damages, including but not limited to lost profits, trading losses or damages resulting from inconvenience, or loss of use of any OPRA Market Data. “Processor” shall mean a central processor selected by OPRA for consolidation and dissemination to vendors and other authorized persons in such formats as OPRA determines to provide. “Participant” shall mean any other national securities exchange or association approved by the Securities and Exchange Commission for the trading of options and party to the Plan for Reporting of Consolidated Options Last Sale Reports and Quotation Information. 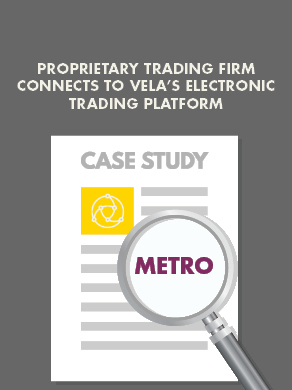 In addition to terminations permitted under this Agreement, the provision of OPRA Market Data to Client may be terminated by Vela upon 30 days’ notice. This Agreement is for the express benefit of OPRA, the Processor and each Participant.